The Time Megeve Mont Blanc 2018 will be the 15th edition of this popular sportive. 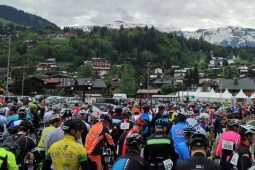 The event will take place on the 03rd June 2018 in the northern French Alps, starting and finishing in the charming alpine village of Megeve. 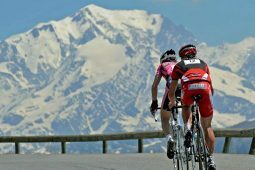 The Time Megeve Mont Blanc offers cyclist’s the opportunity to test themselves on some of famous Tour de France climbs such as the Col de la Forclaz, Col du Pre and the Col des Saisies. For the Time Megeve Mont Blanc 2018 we will be offering a 4-night package staying at a luxury chalet in Megeve from Thursday 31st May to Monday 04th June 2018. This will also include a guaranteed enter into the event, return airport transfers from Geneva Airport, continental breakfast each morning, afternoon snacks and two course dinner with complimentary wine each evening. Please note that the Time Megeve Mont Blanc is now part of the Grand Trophee Series making it a very popular early season event with places selling-out on the official website very quickly. If you are interested in doing this event we recommend booking your place early in order to avoid disappointment. 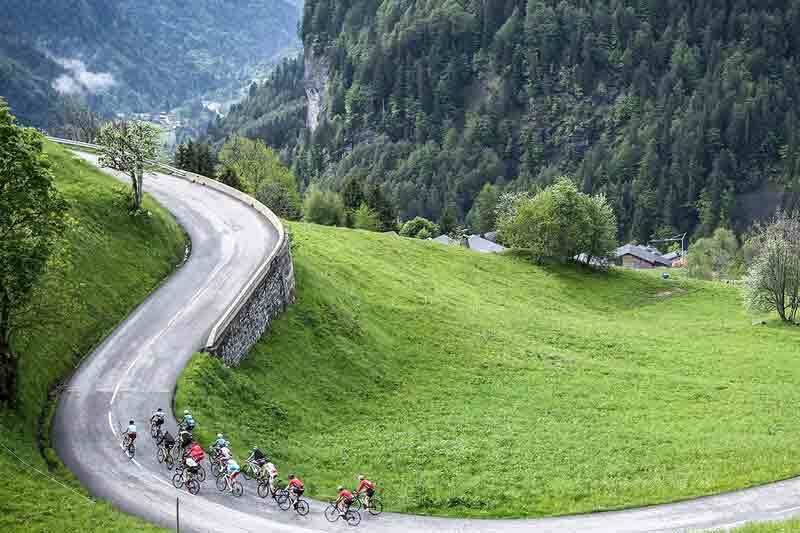 The Time Megeve Mont Blanc 2018 will take place on a “rolling road closure” system, so unfortunately we can not have a support vehicle following you around the route. However, we will have a private feed station at the top of the Col des Saiaies consisting of fresh water, energy drink (in a powder format), energy bars, gels, fresh fruit and some light snacks. You can also place a “goodie bag” on the vehicle containing energy products that work best with you. There will also be a range of tools and spares just incase of any emergency repairs are required to get you to the finish of the event. 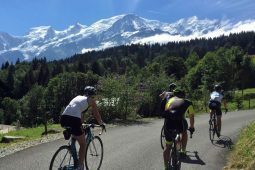 So, if you have a good level of fitness / stamina and looking to challenge yourself, we would be delighted to welcome you on our Time Megeve Mont Blanc 2018 package. This is a general itinerary to provide you with some idea of how the Time Megeve Mont Blanc Package is structured. If you would prefer to shorten or extend your stay please contact us, we are willing to provide you with a package that meets all your needs. You will be met by a member of the Classic Cycling Tours team in the arrival area on the Swiss side of Geneva Airport. The transfers time to our chalet in Megeve will take approximately 2hrs 15 mins. Once at the chalet there will be the opportunity to assemble your bike. We have a good selection of tools, track pumps and bike stands available for your use. Once your bike is assembled there will be an option to go for a short ride to ensure that everything is working order. Before dinner there will be a introductory briefing outlining the schedule for those riders who intend to ride the Col des Saisies on Friday. 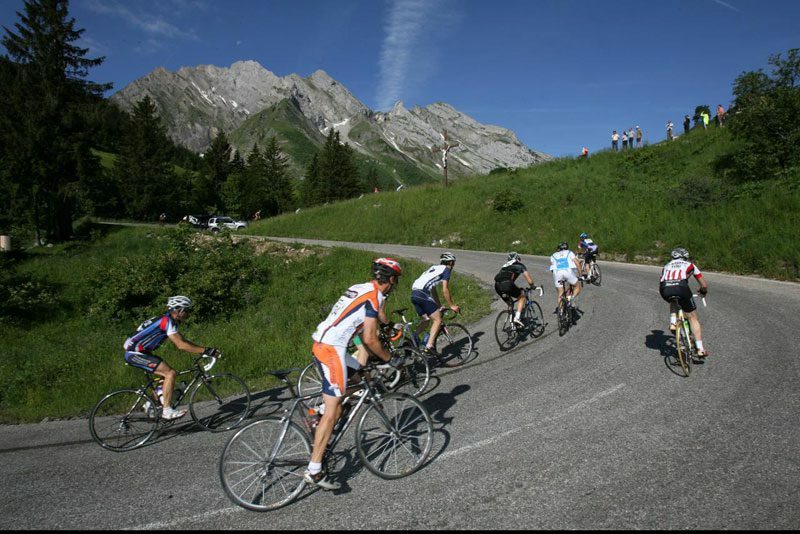 Regardless of which distance you decide to do every route will involve descending down the Col des Saisies. This ride will give you a chance to experience the climb and more importantly the final run into Megeve prior to race day. Before dinner there will be a briefing outlining the schedule Saturday. If you would like to give your legs a final gentle stretch prior to tomorrows big event, we will be offering a optional short ride. 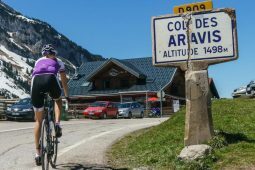 The Col des Aravis is a beautiful 11km climb just above Flumet. Once at the summit there will be the opportunity to stop for some lunch before descending back down to Flumet. 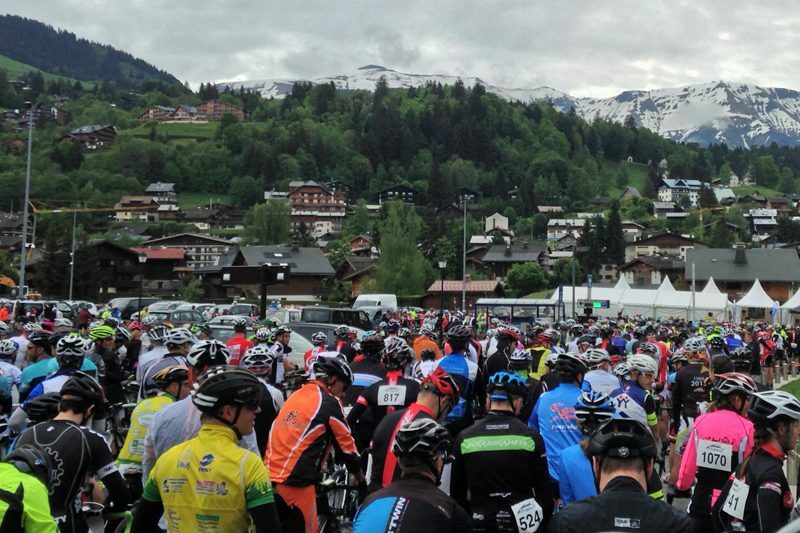 Registration for the Time Megeve Sportive will open at 10am, you will need your Race Confirmation Letter and Medical Certificate. Before dinner there will be a briefing outlining the schedule and route for Time Megeve Mont blanc 2018. The Time Megeve Mont Blanc provides the option of 4 courses over differing distance in order to cater of all abilities. Unfortunately your Time Megeve Mont Blanc week-end as come to an end, we will provide a return Geneva Airport transfer to meet a midday flight. 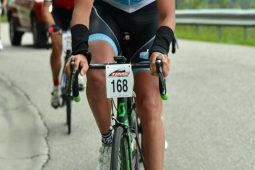 We will provide you with a continental style breakfast each morning and after every ride there will be afternoon snacks consisting of bread, cheese, ham, pasta and cake. On six evening, we will serve a delicious two course evening dinner with complimentary wine. 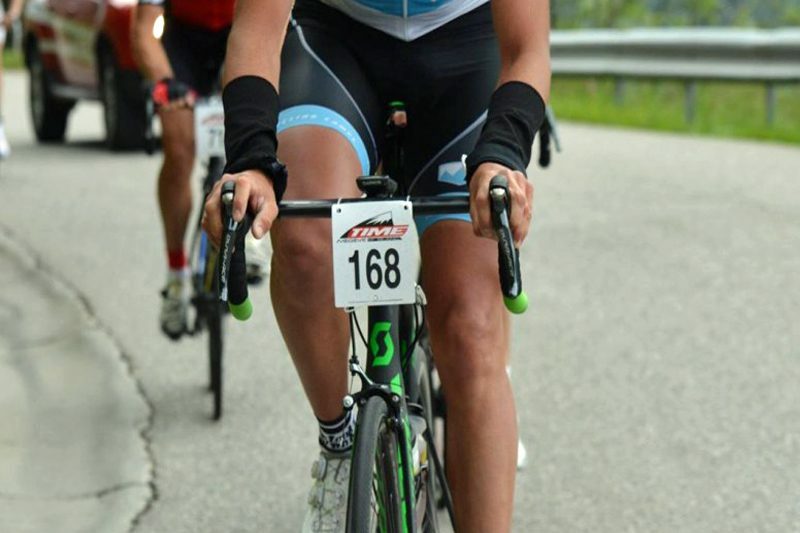 A member of the Classic Cycling Tours team will be in the arrivals area on the Swiss side of Geneva Airport to meet you. We kindly ask you to arrange your inbound / outbound flights to arrive / depart as close to midday as possible. 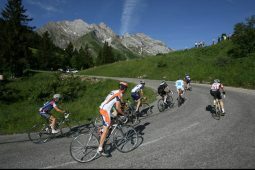 Whilst on the Classic Climbs of the French Alps week you will be accommodated on a shared twin room basis. If you are travelling by yourself you will be paired up with someone of the same gender. If you would prefer a room to yourself then a single supplement charge will be added, please contact us for prices. Please note this option is only available subject to availability. Check rims and if they are worn, cracked or badly dented replace them with news rims or complete wheel. Check and, if required replace brake blocks. Check wheels are “true” and spoke tension is correct. Check and, if required, adjust, grease or replace ALL bearings and quick release skewers. Check and, if required replace brake and gear cables. Check and, if required tighten all bolts (esp. crank, bottom bracket, headset, stem and handlebars. We also recommend that you familiarise yourself with some basic repairs, like changing an inner-tube and fixing a puncher. We will also be there to help, but having these basic skills will help keep delays down to minimum. The better condition you are in, the likely you are to enjoy your cycling holiday. We recommend you adopt an achievable weekly exercise programme that includes some long rides in hilly terrain. Getting out on your bike is obviously the best way to prepare for your holiday. However, swimming, running and circuit training are good for developing your aerobic fitness and stamina. At Classic Cycling Tours the safety and well-being of our guests is of the upmost importances to us. Due to the nature of cycling and the terrain you will be riding in, unfortunately accidents can occur. Therefore, it is mandatory that you have Personal Injury Insurance that covers you whilst on a cycling holiday. If you do not have any cover we recommend using “Yellow Jersey Cycling Insurance”. Thank you so much for the fantastic holiday my bike has taken me to some memorable places but you, your staff and your bikes took me to breathtaking places. I enjoyed every minute of the trip, the meals, the service and the friendliness of everyone was incredible take care.